The Cleveland Browns appear ready to let the quarterback decision make itself. For the first two preseason games, Browns quarterback Brock Osweiler started for the Browns. The Cleveland even tried to hype him up. It certainly helped that he wasn’t playing the worst football of his career. Then came the rumor that Osweiler had done so well in the preseason, that he would soon be named the 2017 starter. Brock was sitting on top of the world, and so were the Browns. Get a second round pick and a starting quarterback for taking a cap hit? That sounds like a way to win football games to me. Then came the Aug. 10 game against the New Orléans Saints. Osweiler did not have a terrible game, and the Browns beat the Saints, but his 75 percent completion mark and an interception didn’t seal the deal. On the same night, DeShone Kizer, the Browns’ rookie quarterback, had a good night. Kizer, Cleveland’s pick at 52nd overall in the 2017 NFL Draft, has had a good camp all around. Even before Monday night’s game, rumors had been floating around that Kizer could still win the starting job. After Cleveland’s ‘ game versus the Giants on Aug. 21, Hue Jackson was finally ready to name a starting quarterback and it was reported that he would name a starter this week. Jackson almost did. 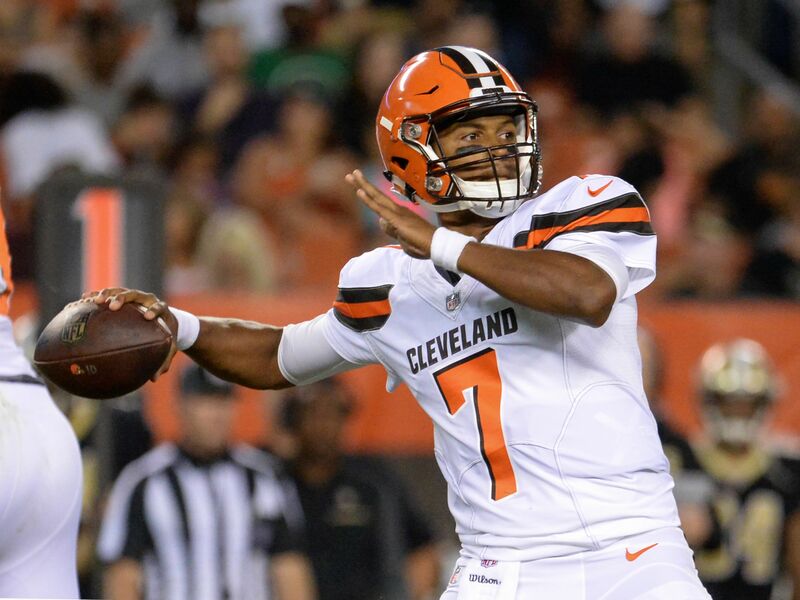 Early on the morning of the Aug. 23, Hue Jackson released a statement naming DeShone Kizer as the starter for Cleveland’s third preseason game against the Tampa Bay Bucs. The full statement, as reported by Ian Rapoport, is below. According to the Cleveland Browns website, Kizer has had a 61 percent completion rate (19/31) for 258 yards and a single touchdown. He has also been a threat on the ground, rushing for a touchdown and 47 more yards. He has led the team to 24 points while he’s been on the field. Kizer has a chance to win the starting job for 2017. The Browns are set on doing their best this year, and they will find out early if Kizer can be the face of the franchise and the future of the team that they hoped he could be in the middle of May.